Home Proclamation No. 704 s. 2019 Proclamation No. 704 s. 2019 - Special non-working day in Municipality of Pinamalayan, Oriental Mindoro. Proclamation No. 704 s. 2019 - Special non-working day in Municipality of Pinamalayan, Oriental Mindoro. 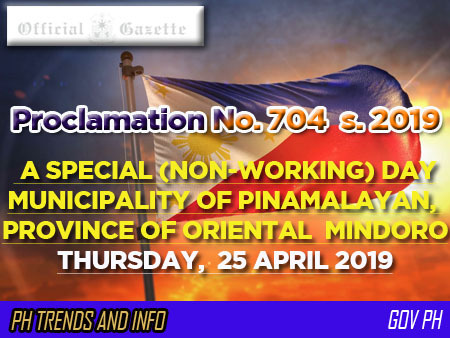 DECLARING THURSDAY, 25 APRIL 2019, A SPECIAL (NON-WORKING) DAY IN THE MUNICIPALITY OF PINAMALAYAN, PROVINCE OF ORIENTAL MINDORO. NOW, THEREFORE, I, SALVADOR C. MEDIALDEA, Executive Secretary, by authority of the President, RODRIGO ROA DUTERTE, do hereby declare Thursday, 25 April 2019, a special (non-working) day in the City of Himamaylan, Province of Negros Occidental. Done in the City of Manila, this Lord, Two Thousand and Nineteen. 3rd day of April , in the year of Our Lord, Two Thousand and Nineteen.